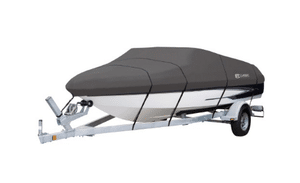 Get The Best Boat Covers For Outdoor Storage, Winter Snow, Trailering & More! If you want your boat to last for a long period of time then one of the best things you can do to protect it, is to get yourself a boat cover. A boat cover will help to keep your boat from fading in the sun and it will help to keep both the things onboard your boat, as well as the boat itself, in better shape. Boat covers come in all sorts of different shapes and sizes and they often come with a bunch of other boating products. It is extremely important to make sure that you know what you should look for so that you aren’t disappointed with what you get and so that your boat and contents on your boat are properly protected. We share some of our top boat cover recommendations as well as some shopping tips below. In order to assist you with your shopping, we have come up with a buyer’s guide that you can use in order to inform yourself about the various aspects of a boat cover and what makes certain things important. We have also come up with a list of our picks for some quality boat covers in order to make the process of looking for one a lot easier for you and to show you some real life examples of what quality looks like. The most important thing to do when you are shopping around for a boat cover is to make sure that you buy the proper size. An improper size boat cover is going to either not cover your boat properly and therefore not protect it fully or it will be too large and therefore won’t be secured well onto your boat. Always double check to make sure how big your boat is and double check to make sure that you are buying the correct size cover before making a purchase. If you are planning to buy a boat cover and you have no idea what you should be on the lookout for, you should always look at the accessories that come with the cover. Accessories can make a huge difference to both the price of a product as well as the value of the product you are purchasing. Look for things like a storage bag for your boat cover so that you don’t damage it when it is not in use. In addition, it is always nice when the manufacturer includes extra straps with your purchase so that you can make sure everything will always be secure. A supporting pole is one other important accessory to look for as it will allow you to put on the cover without having to worry about water pooling in your cover potentially flooding your boat and running your cover over time. One thing that you are going to run into issues with if you leave your boat out for extended periods of time is moisture. The problem with moisture is that it provides a perfect opportunity for harmful mold to grow and if at all possible, you should take steps to avoid this occurring. Putting a boat cover on a boat provides an environment that is prone to becoming moist and therefore you should always look for a cover that has vents in the design so that moisture can escape. You may argue that vents aren’t great because it allows bugs to get into the boat, but a moldy boat is not a boat that is safe to be on in a lot of cases and it is going to be a lot harder to clean than getting rid of a few bugs. If you have a boat cover that doesn’t have a lot of support in its design, you run the risk of the cover flying right off of the boat. If the wind hits the cover in the right direction and swoops into the vent of a boat cover, it can create quite a bit of pressure on the cover and can result in a poor quality design blowing away. To avoid this, look for a boat cover that has a lot of straps and you should also look for a boat cover that has things like a support pole and a quality seal all the way around the entire length of the boat. Different boat covers are secured to boats in different fashions. It is always important to look at how the cover attaches so that you can have a better idea if you are buying yourself a quality cover. 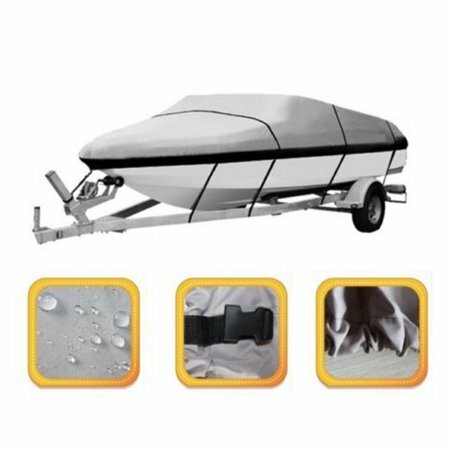 Most boat covers on the market attach to your boat by buckles or straps and depending on the quality, you will notice that there are differences. The best units on the market use quick release buckles and quality, thick, adjustable straps to make sure that your boat is nicely secured. If you want to make sure that your boat cover is going to last you for a long time, then truly the best thing that you can look for is a warranty that extends out over a long period of time. It is a good idea to read through company warranty on a boat cover, before going ahead and buying one as the coverage can range from product to product. It is always important to make sure that you get something that offers you the protection that you want first of all, but warranty should almost definitely be the 2nd thing you look at as it can give you a great idea of how long you can expect the product to last for before running into problems with the design. To give you a better idea of which products are the best choice for your boating needs, then take a moment to read our reviews below. If you want to make sure that you are getting yourself a quality boat cover, you won’t go wrong if you decide to purchase this design. This is a very nice boat cover made up of high-quality polyester canvas material. The cover is available in multiple sizes and it even comes in four different color options so that you can get something that suits both your personal tastes as well as the color of your boat. If you are looking to get quality for a pretty low price tag, you should make sure that you look carefully at what this design has to offer. This is a great boat cover that is more than capable of staying secured to your boat thanks to the quality quick release straps on the unit. As long as you don’t need a super heavy duty cover and you want something that both looks good and is easy to take on and off, you should definitely think about purchasing this design. This is a very nice low priced boat cover that you may want to consider if it comes in a size that you need. This boat cover comes in three different sizes and is made out of a durable polyester material. The unit fits on the boat quite snugly and is quite capable of being able to protect your boat from the elements after it is installed. As long as you aren’t looking for something that is super heavy duty, you are going to be pretty happy with what this design has to offer. With its waterproof design, it is more than able to make sure that your personal boating items stay nice and dry. The unit is very secure and the fact that this product comes with a relatively low price tag really helps to sweeten up the deal. This is definitely a very nice boat cover and would be the ideal cover if you are on a budget and want something to help protect your precious boat. If you have a bit of a higher budget for a boat cover and you want to make sure that you get all of the fancy features, you should make sure that you take a look at what this design has to offer. This is a very nice unit that is made out of polyester materials. The unit comes with a variety of accessories to help sweeten the deal and make this product worth every penny. As long as you have a boat that is compatible with this cover, you are not going to be disappointed with what you get if you decide to purchase this unit. This is a high-quality boat cover that is built to be able to last for a long time. Even if you don’t trust that this cover can last you for a long time, the cover is backed by a very generous five-year warranty so you really don’t have a whole lot to worry about if you decide to purchase this product. If you can afford to purchase this cover and it fits your boat properly, you should definitely make sure that you are at least considering this nice boat cover as an option. If you want to buy a boat cover that is about the middle of the line as far as price goes, you should make sure that you take a look at what this company has to offer. This is a very nice boat cover that is capable of being able to fit 20, 21 and 22 foot long boats. The unit is made out of a polyester material and is designed to be breathable for moisture relief as well as waterproof so that your boat doesn’t get soaked when it rains. As long as you don’t mind a gray design and you have a boat that this cover fits, you will not be disappointed with what you get out of this cover for the price tag. This unit may not be the most durable on the market, but it will protect your boat from sun and water damage. If you don’t need a heavy duty design and you want to get something that is both affordable and relatively easy to use, you may want to take a careful look at this product before making a purchasing decision. If you are on a really tight budget for a boat cover, you may be interested in what Pinty has to offer. This company creates some very nice boat covers, for a very low price tag. The best thing about this boat cover is that it is quick and easy to install. 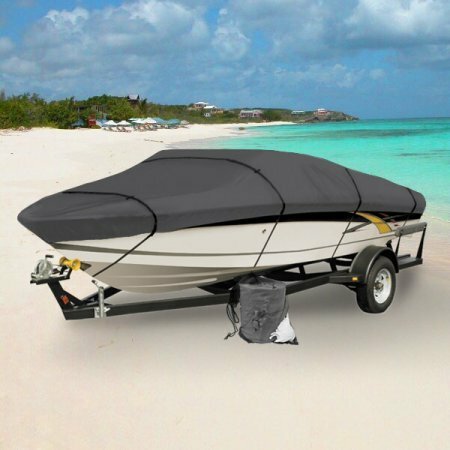 The boat cover is made out of a polyester design and is designed to be able to hold up through tough weather conditions without tearing off of your boat or breaking in general. As long as this cover can fit onto your boat, you are going to have a hard time saying no to this cover thanks to its low price tag. Although this unit may not have the most secure fit on the market, it is definitely designed to be able to last through bad weather and extended use. The fact that this unit comes with a storage bag for this low of a price tag is quite surprising and definitely adds to the value of this low priced deal. If you are on a budget and you want to get something that will protect your boat, but that is also easy to use, you should definitely think hard about whether this product could work for you. After reading this article, hopefully, you now feel as though you have a better understanding of what you should look for in a boat cover. It isn’t easy to pick one out as there are a lot of them on the market, but it is a very important piece of equipment to have if you want to keep your boat in good shape. It is extremely important to make sure that the cover that you are purchasing is capable of being able to fit properly over your boat. If you are unsure of the size of boat you have, you should always remember to take proper measurements beforehand or look in the owner’s manual to make sure that you buy the correct size boat cover to suit your needs. Best of luck in finding an awesome boat cover and hope that you have fun out on the water.